Interestingly, Vantine's was purchased in the 20's by Arnold Rothstein, an early mob drug dealer. In the mid-1920s, Arnold Rothstein saw illegal drugs as an untapped field, one that could be developed and profited from. The drug traffic was unorganized and there was little competition on the level Rothstein chose to enter. In fact, the only competition at that time was provided by unethical doctors. Rothstein's plan was to purchase and sell in quantities so large that no one could compete with him. He could regulate supply and demand on an international basis. In 1923, a kilo of heroin, 2.2 pounds, could be purchased for $2,000. It could then be cut and resold for $300,000. Rothstein's interest in narcotics was strictly for wholesaling. He would need a network to sell the drugs and the rum running and bootlegging market already in existence would serve as his pipeline. Lucky Luciano and Waxey Gordon were in place in New York City and New Jersey. The Torrio – Capone Empire was interested in Chicago. Charles "King" Soloman was ready in Boston, as well as Harry "Nig Rosen" Stromberg in Philadelphia. In addition, mobsters in Detroit, Kansas City and St. Louis showed an interest. Among the buyers Rothstein decided to do business with was Jacob Katzenberg, who was already serving the New York mob as a liquor buyer in Europe. When Katzenberg teamed up with Rothstein in 1926, they began purchasing from European sources. 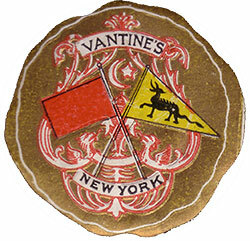 Rothstein purchased "Vantines," a well-established importing house in New York City. The importing house had an excellent reputation and was known as a legitimate enterprise. When shipments arrived for them, customs officials gave their merchandise only a cursory search. Vantine's would become a perfect front for the smuggling operation. Rothstein also owned several art galleries and antique shops that would also serve as fronts. On November 3, 1928, Arnold Rothstein was shot and mortally wounded in Room 349 at Park Central Hotel, during a creditors meeting where he had went to discuss a game IOU of $390,000. Rothstein had put all of his drug profits back into the business so when he was murdered he had untold millions invested. Upon his death Luciano and Louis "Lepke" Buchalter became the new overlords. Their first order of business was to make Katzenberg their principal buyer in Europe. Digging up Rothstein's past to discover clues to his murder, investigators connected Rothstein with all manner of large-scale crockery. Federal agents announced they had certain proof that Rothstein was associated in an international narcotic syndicate with the dead Alfred Loewenstein, the Belgian financier who plunged from his plane into the English Channel. Papers found in Rothstein's files led to the discovery and seizure, in Grand Central Station of two trunks containing $2,000,000 worth of opium, cocaine, heroin, and morphine.